There are douze mois (12 months) in une année (a year). * When a French noun begins with a vowel (a, e, i, o, u) or a silent h, instead of using le or la (= the) before the noun, the contraction l’ is added to the beginning of that noun. The French months of the year do NOT start with a capital letter as in English (unless they are at the beginning of a sentence). You may see two different spellings of the word for August in French… août and aout. L’accent circonflexe disparaît sur le i ou sur le u à moins que cet accent ne permette de distinguer des mots entre eux. The circumflex accent (ˆ) disappears on the i or u unless the accent allows to distinguish between words. The proposed change was upgraded from optional to standard and for use in school books by the Académie française in 2016. 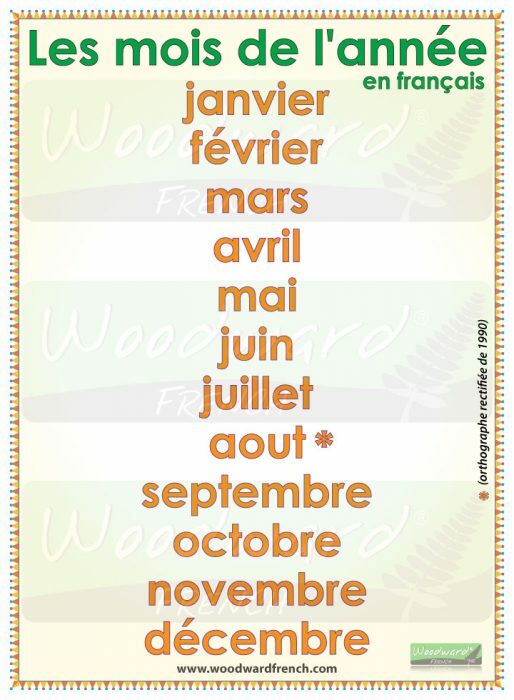 If you want to say IN a certain month, you use the french word EN followed by the month.